Rev. 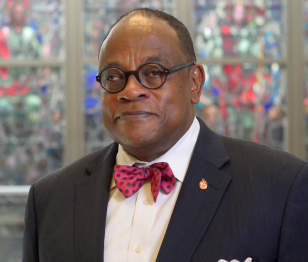 Dr. Stephen G. Ray Jr. is the President of Chicago Theological Seminary. In addition, he is the President of the Society for the Study of Black Religion. Having written and lectured broadly in the areas of Systematic Theology, African American religion, human rights and the intersection of religion and politics, President Ray’s current work focuses on reinvigorating the public square as a place for all and reclaiming a vital expression of progressive religion in that project. Read his blog, View From The Corner, here. Silenced By the Night: A Constructive Reconstrual of the Protestant Doctrine of Sin. Ph.D. thesis, Yale University, 2000. Contributor, Constructive Theology: A Contemporary Approach to Classical Themes, Serene Jones and Paul Lakeland eds. Minneapolis: Fortress Press 2004. Co-author, Black Church Studies: An Introduction. Nashville: Abingdon Press 2007. Editor, We Have Been Believers: An African-American Systematic Theology 20th Anniversary Edition. James H. Evans, Jr. (author). Minneapolis: Fortress Press 2012.